If you haven’t seen the Simon Sinek video How great leaders inspire action then you need to also take the time to look at that. However, make sure you come back and also watch this one. In this video Simon breaks down what makes good leaders and how they tick. Unfortunately our current business environment is not promoting inspiring leaders who create a better world. In fact it is creating a world full of scared people who are afraid to help others. Watch the video and see what you think. I’m fairly confident it will make you think. Not quite sure why it is considered ‘legacy’ (may be it is being changed?) but now I’m also a Microsoft Certified Solutions Associate! Which I have also passed a while back. My advice having now done the three exams is that it is very worthwhile to start with the 74-325 first to get a flavour of what these Office 365 exams are like. The 70-346 and 70-347 are certainly much tougher and more focused on the the enterprise features of Office 365 so you’ll have to work hard to pass them. The challenge with all these Office 365 exams is that they cover such a wide range of topics. To pass you are going to have to know SharePoint as well as Exchange. You are going to have to know how to do things with PowerShell and via the administration portal. Finally, you are also going to have to know how to interface Office 365 to on premise servers and desktops. That is a lot to know for ANYONE! If you need a hand with the 74-325 exam I have an exam cram guide for sale on my publications page that helped me (that’s why I created it). Even though I now have these exams under my belt there is still a HUGE amount of stuff I am still learning about Office 365 and I honestly discover something new just about every day I use it. That’s what makes it such a great product for me as it appeals to my inner geek. Full disclosure – the review unit was supplied by Mobilezap. You can find this device and others at the Mobilezap category page. One of the really cool things that Nokia phones come with these days is wireless charging. That means you just place the phone on the charging stand when you are not using it to keep the battery full. I have been dying to try this out and was recently given the chance to try the Nokia Wireless Charing plate. In my testing I found the charging plate to work very well. It does take a little familiarization to ensure you get the phone lined up correctly but a little light on the base tells you when the phone is charging. Now obviously it will take a little longer to charge wirelessly than if you plugged in the USB cable but the convenience factor totally makes up for that. The good things that I also found were firstly, it charges through the cover I have on my Nokia and secondly it seems to also charge the Nexus 5 phone I have! The downsides are that if it needs to have a long charge the phone can get quite warm, but I have seen with other charging methods as well (especially via the car charger). All in all this is an extremely handy device that you can simply set on your desktop somewhere and then simply place you phone on to ensure it remains full charge. No more plugging and unplugging of USB cables, so for that it is certainly value for money. Because it is so convenient you’ll probably keep your phone charged longer which overcomes the downside of taking longer to charge. Just watch the heating up during long charges. I’d certainly recommend this to other Nokia phones users (and perhaps those using a Nexus 5). Thanks again to Mobilezap for the opportunity to evaluate. The ePub and MOBI (Kindle) formats of my latest book “Getting Started With Lync Online 2013” are now available from the CIAOPS publishing site or booksellers like Amazon. This also along side the existing PDF versions as well. Don’t forget that I have also made the previous version of this book, based on Office 365 Wave 14 available for free download. I am now working on the second edition of the Getting Started With PowerShell for Office 365 book which I expect to be out in the next few weeks. As my new Lync Online book has been published I am open sourcing the superseded Wave 14 version, which is still of value in many respects, however it will now be free to download in PDF, ePub and MOBI formats. Here is our weekly free Ask Us webinar for February 20, 2014. As you can probably tell if you watch, I wasn’t in attendance but by partner Nigel Moore put me to shame in running this one. Well done! If you can’t attend attend shoot your question through to infor@cloudbusinessblueprint.com and we’ll do our best to get it answered for you and then you can watch on the recording at your leisure. It pays to be enthusiastic! Since I put my name down to be kept up to date with OneDrive developments I received notification today that it has launched and is rolling out as we speak! 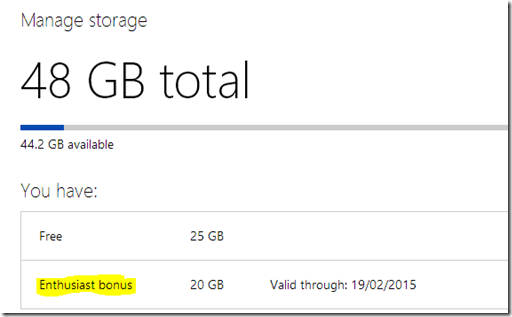 But I also found out that gave me a 20GB storage bonus for 12 months just for being ‘enthusiastic’! I can’t wait for my existing SkyDrive apps to start updating to OneDrive. My question is when is OneDrive for business going to hit my Office 365. I’ll just have to stay ‘enthusiastic’ and find out!